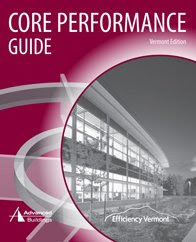 If your project isn't a health care, warehouse, or lab project and is under 100,000 gsf, you're able to use the Advanced Buildings Core Performance Guide to earn anywhere from 2-5 points based on the number of strategies you implement and the project type you have. Offices, schools, public assembly and retail projects are eligible for up to 5 points, while all others excluding the healthcare, warehouse, and lab projects can only earn 4. The guide is available for $95 from here, OR you can get a free, slightly edited version courtesy of Efficiency Vermont here!!! FYI - you'll need to email info@efficiencyvermont.com for the password. From what I can tell requirements for other regions are still contained in the guide, though Vermont folks are lucky enough to have all of their standards highlighted! Where the standards aren't listed there is a link to the AdvancedBuildings website with a password (in the VT edition) that earns you access to more reference materials. From what I can tell, much of this is similar to ASHRAE 90.1-2001 performance requirements, but I'm a blogger and as such have only really skimmed the requirements. Components of the guide align with other LEED points, and there are handy guides to help you see where these overlap. The main point here is that many projects will be able to earn a significant amount of EAc1 points without the need for frequently costly energy modeling services. To be clear, I certainly suggest using energy modeling, preferably early in the design process, but sometimes such detailed modeling required by other EAc1 options is not necessary. I have yet to have any experience implementing this guide and would really appreciate to hear from those of you who have! Please leave a comment about your experiences! Were you actually able to get the password from them? After contacting them, they just sent me a link to NBI to buy the guide. When did this compliance path go into effect? Can I use it even if it was announce after my project was registered? I'm working with a building that will be the pharmacy faculty in a college campus. It has some laboratories, but they do not occupy the majority of the building. Can this guide still be used? It is more of a school and assembly building than a laboratory building. I echo the comments from September 9th. When I received my email from the organization granting the Password, it contained nothing more than links to where the guide could be purchased. ADDENDUM: I have contacted Efficiency Vermont again and they have graciously provided me with the password when explained that I was told it was available for free download. Contact kathleen Brown at kbrown@veic.org and she will be happy to help out. I apologize, but I found out about this via a friend who just told me the password and where to grab it. I assumed it was available since they post the dang thing online for anyone to grab?? ?